If you registered for the Diablo III beta, log into your Battle.net account, then click on the "ACCOUNT" tab to find out if you're one of the lucky few. Even if you aren't in today, don't lose hope. 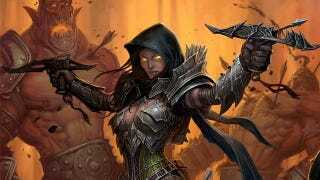 Blizzard also says it's "planning to add more participants over the course of the beta test." The closed beta lets players explore part of Act I from Diablo III, experimenting with the game's five classes—barbarian, witch doctor, wizard, monk, and demon hunter—and the game's skill and crafting systems. It's largely the same content we played a couple months ago at Blizzard HQ. The beta client (which runs approximately 2.7 GB) is available for Mac and Windows PCs and should be available for download right now if you were selected. "This closed beta test is an important milestone for us as we enter the final stages of development on Diablo III," said Mike Morhaime, CEO and co-founder of Blizzard Entertainment. "Our goal is to create the best action role-playing game experience to date, building on everything we've learned since the release of Diablo II and incorporating the powerful features of the new Battle.net platform. We hope players enjoy participating in the beta test and we look forward to hearing their feedback." So... did you get in?